It's Monday, and it's time for the second of our two newest Transformers: Prime figures (thanks again to Jason for scoring this guy). Today, we're going to take a look at Sergeant Kup, the grim, wise around the eyes veteran with a story for everything. Yup, just like the Shryke bats of Dromodon! You know, this figure reminds me of the time... well... take a look after the jump to find out. Sergeant Kup comes packaged in the same case as our punk friend Rumble making up the new 'Series 05' of the Transformers: Prime 'Revealers'; also know as Deluxe scale. Kup comes in the standard Transformer's Prime white and red card with the yellow detailing once again pointing out that Kup comes with one whole episode of TF:Prime on DVD. As per the "norm", SERGEANT Kup (there's that copyright again) comes packed in Alt-mode with some really nice character art showing off his Bot-mode on the front of the card. The back of the card gives us a look at Kup in both modes, a note making sure we KNOW he has accessories, and his Bio. Like most of the current packaging, Kup's Tech-Spec adorns the side of the bubble. The Bio glances over Kup's tendency to tell stories from his past based on what he is currently experiencing... 'This reminds me of the time... etc.'. It focuses more on Kup just being a hardened veteran. I see Kup as more of Apone from 'Aliens', this Bio makes Kup sound more like Tom Sizemore's character Sgt. Horvath from Saving Private Ryan. Battle flaring all around, and he just strolls on through... and that's how our new Kup is portrayed... and I'm good with that. I still like the Apone angle more though. I noticed that the DVD that came with Kup is the same episode of Transformers:Prime that came on the DVD with Rumble.it's the Season 2 episode 'Loose Cannons'... the one where Wheeljack returns to hunt down Dreadwing for killing Seaspray. Plastic tray, paper ties, origami instructions... the usual. First impression out of the package... this is NOT Kup. It's freaking Ironhide. For whatever reason, when Hasbro imported this mold, we got it as Kup. 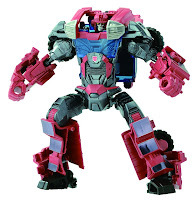 Takara released the mold as whom it should be, Ironhide. But, let's take a look at Kup, then we can compare. 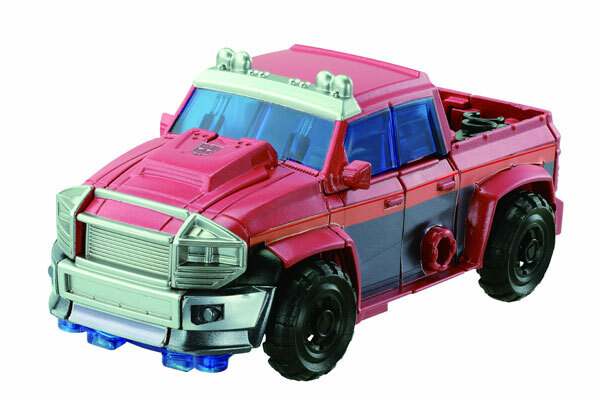 Based on Ironhide's movie incarnation, Kup comes as a pick-up truck. Kind of rugged looking and bulky. Molded primarily in an aqua/teal color; there are spots of green tampo'd on with a grey and greenish gunmetal detailing on a few parts, namely the grill and bumper. Kup's wheels are molded in solid black with NO paint apps. The truck bed shows Kup's feet, also molded in black. Now, we do have a version of Ironhide available to us here in the states, the Cyberverse Commander scale Ironhide. Surprisingly, hes not much smaller. As you can see, Kup even comes with Ironhide's arm cannons, molded in all black with NO paint apps. Kup's transformation is remarkably like Cyberverse Ironhide as well. The truck bed and tailgate become the feet and legs. The sides of the truck become the arms. The top of the truck winds up on his back and the hood turns into the shoulders and where the head is hidden. The one thing that bothers me about this mold is the truck hood. In Bot-mode, it's this huge piece of kibble that just hangs off of Kup's back. They could have easily put a hinge in it to make it fold back and tuck in. It really is an eyesore on Kup's otherwise decent mold. The arm cannons fit on, of course, the arms. There's a nice, obvious peg hole for them to fit into. This, once again, screams IRONHIDE! This is what Takara put out overseas, Ironhide. Movie Ironhide, in a more G1 color scheme, upgraded to fit into the Prime universe. I definitely like this mold better as Ironhide. Since this mold is supposed to be Kup, I wanted to get rid of the Ironhide head. And what better head to use my second iGear's Kup head... the Cy-Gar-less one that is still in it's little box. So, I unscrewed the back of Kup's head. Come to find that the head is built for light-piping, but for whatever reason it wasn't. The tips of the piece that fit in the eye sockets are painted yellow. The other thing I found was that when trying to replace the head, this new mold has the peg built into it and it in turn is connected to the body. Not a post in the body that the head pops onto. I could replace the head with some minor surgery, but I'm too lazy to go that far for this mold. Besides, I like the size and look of the Generations Sergeant Kup more. The only other Kup figures I own beside IronKup are the aforementioned Generations Sergeant Kup and the Timelines Rookie Kup from the 2009 Botcon 'Wings of Honor' set. Like I said, Generations Kup is indeed my favorite of the bunch, especially with the Cy-Gar chewing iGear head. The Wings of Honor Kup is a retool of the Cybertron Red Alert figure; the retool part being the head. It's not a bad figure, but it's not all that great either; he's incredibly chunky. Overall, the Transformers: Prime version of Sergeant Kup isn't a bad toy. The joints are all good; comprised of ball with some swivels and hinges. The colors are good for Kup, if a little greener than normal. I just think it was a poor choice of mold. This toy should have come to us as Ironhide as was intended. But Hasbro sent us a repaint of a mold that we never got the first iteration of. I think that's the part that gets me the most. Hasbro usually gives us a head-swap to denote a new character, but for Kup, it was merely repainted. Nice and lazy. Way to go Hasbro. Nonetheless, if you like the character, if you like the mold, get this fig. Even with what I perceive as negative, it's still a nice mold and should look good sitting in on your collection... as Shattered Glass Ironhide. Alright, sweethearts, you heard the man and you know the drill! Disposal chutes and rotator cuffs! Pics, review, and heroic nonsense by Scion of Primus.